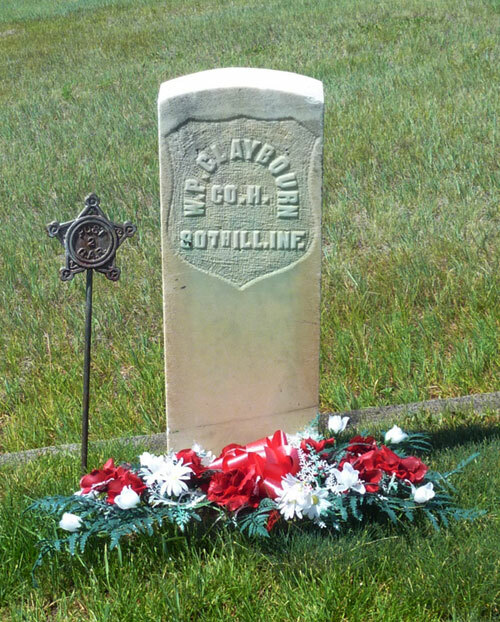 The goal of the Sons of Union Veterans of the Civil War (SUVCW) National Grave Registration Project is to locate the final resting places of all Union Civil War Veterans, and enter that information into the National Graves Registration Database. This undertaking is rather large and needs as many interested people to assist as possible. As with any project such as this, considerable fieldwork will be needed to obtain the information that will eventually be placed into the National database. Individuals who wish to assist the SUVCW may obtain a Grave Registration packet (consisting of a set of instructions, list of abbreviations and a Graves Registration form) at the end of this Web page. Each completed form will represent one Union soldier’s grave. Upon completion of the form, it can then be mailed to the National Grave Registration Officer for inclusion in the National database. For those individuals who wish to register a large number of grave sites, please contact the National Graves Registration Officer for assistance. Updated or additional information for Civil War veterans previously registered should be marked “UPDATE” and sent to the above National Graves Registration Officer. In order to complete this project, it will literally take an army of volunteers. Within the SUVCW, many Departments and Camps are currently working on the project. However, additional help is needed. Individuals and organizations are encouraged to assist in the project. For instance, individual descendants of Union veterans can register their ancestors’ graves and organizations can adopt entire cemeteries for registry. The key to the success of the project will be based on how well the data is collected and recorded. Incomplete Grave Registration Forms or databases (in the case of the entry databases) that contain incomplete information do neither the volunteer nor the veteran whose grave you are trying to register any service. It is important that you ensure that all the available information is obtained and recorded before you turn your work in to the National Graves Registration Officer.